Organic gardening is commonly used to describe cultivation systems which make minimal use of manufactured chemical substances. These are practical elements of a broader philosophy which takes a holistic view of gardening, emphasizing the interdependence of life forms. Conserving natural resources and avoiding pollution and health hazards are important elements in the concept of organic gardening. A fundamental feature is reliance on manures and fertilizers derived only from animal or plant remains. Organic gardening is a proven way of gardening well and which avoids the use of practices, pesticides for example about which some gardeners have misgivings. However where plants’ requirements for steady growth are met, including choice of site, timing of planting or sowing, soil preparation, nutrition and watering, the occurrence of damaging attacks by pests, diseases and other disorders is less likely and less damaging. Successful gardening following organic principles therefore requires a dedicated and informed approach. Many gardeners find this challenge rewarding, or at least a cost worth paying for avoiding potentially harmful practices. Organic gardening involves feeding the soil which in turn supports healthy plant growth, as opposed to directly feeding plants themselves. All possible steps should be taken to develop or improve and maintain soil fertility, except in special instances such as sites intended for the establishment of wild flowers. The above practices are not exclusive to organic gardening, but they are important features. 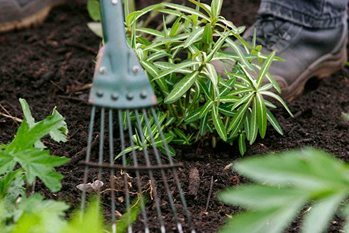 Undisturbed soil favours many beneficial soil-inhabiting organisms, and no-digging is often favoured by organic gardeners as in some cases it preserves soil structure and reduces moisture loss by evaporation, but it does require extra skill. Digging allows incorporation of bulky organic manures and lime, as well effective weed control. When their use is essential certain pest and disease control materials that are derived from animal or plant materials are often considered acceptable in organic growing. These have short persistence and low toxicity to birds and mammals. Even these relatively benign substances must, by law, be used as directed on the label. Chemical weedkillers can greatly ease controlling infestations of pernicious weeds, but are unacceptable in organic gardening. Without the fallback of potent weedkillers it is advisable to tackle the problem before heavy infestations develop.